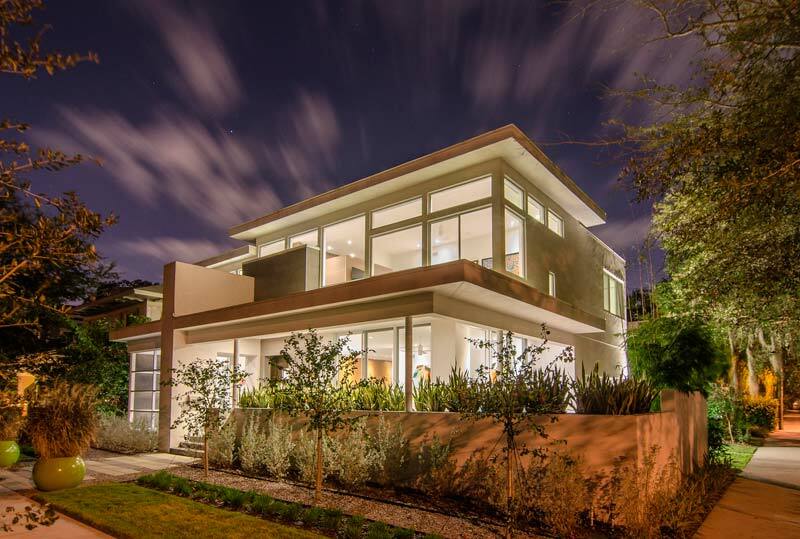 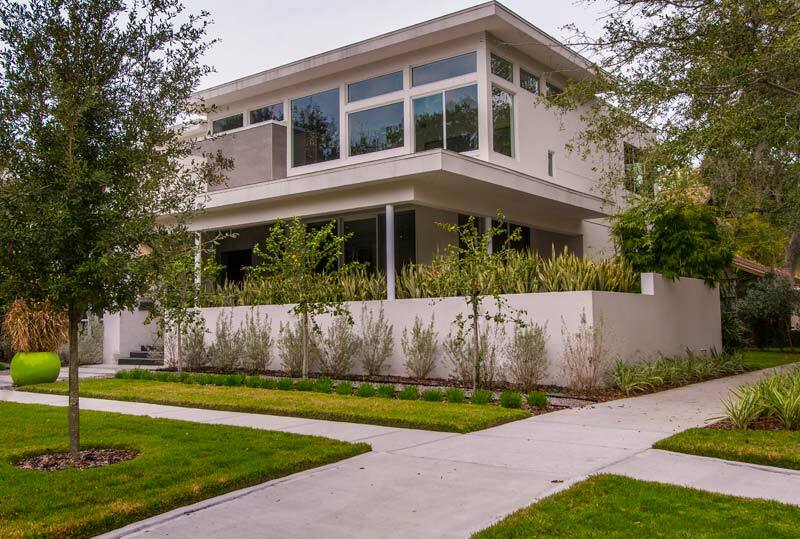 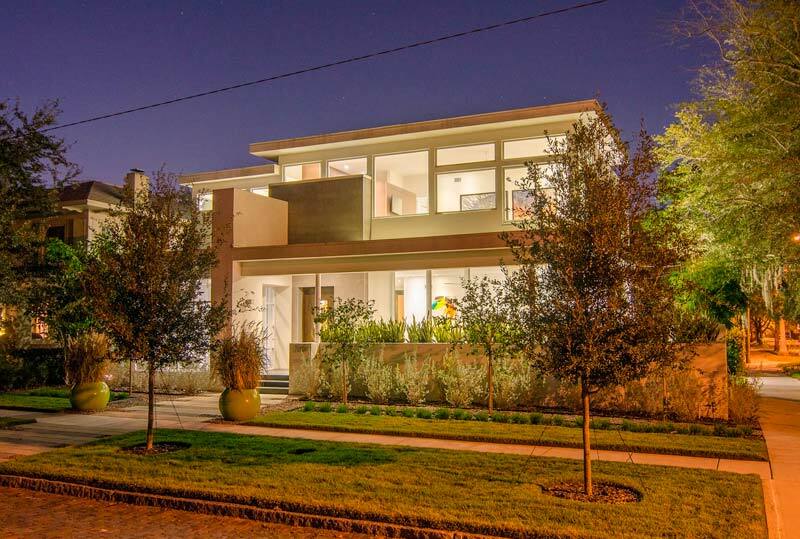 This contemporary home maximizes wide open views of the golf course. 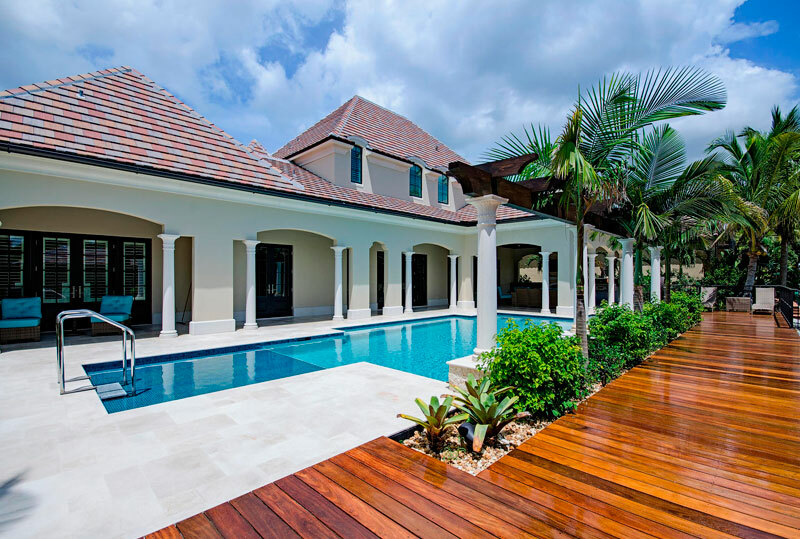 New construction means the house is situated perfectly to enjoy the mature shade trees with plenty of room for the pool. 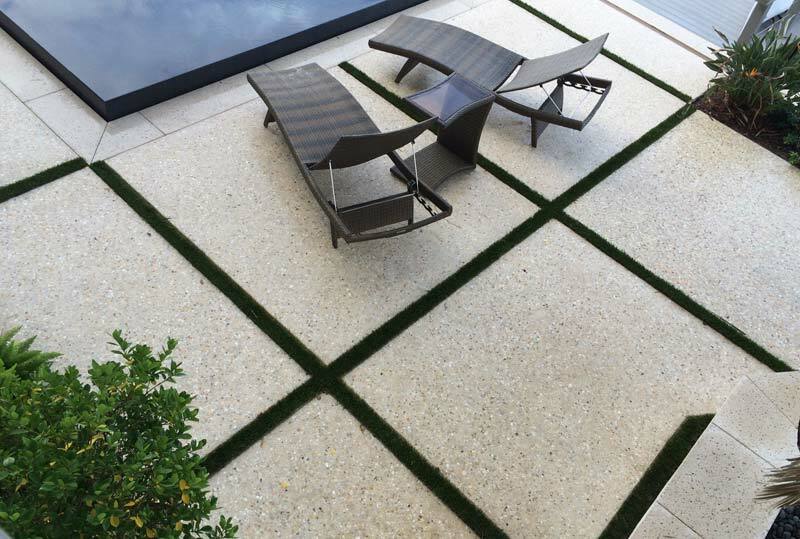 The modern design features synthetic grass, a concrete and rock front walkway, an outdoor kitchen and built-in gardening nooks in both front and back. 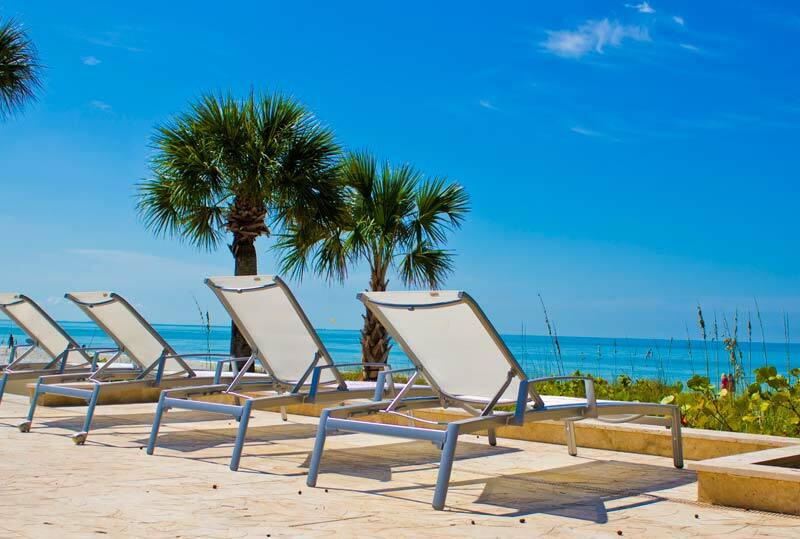 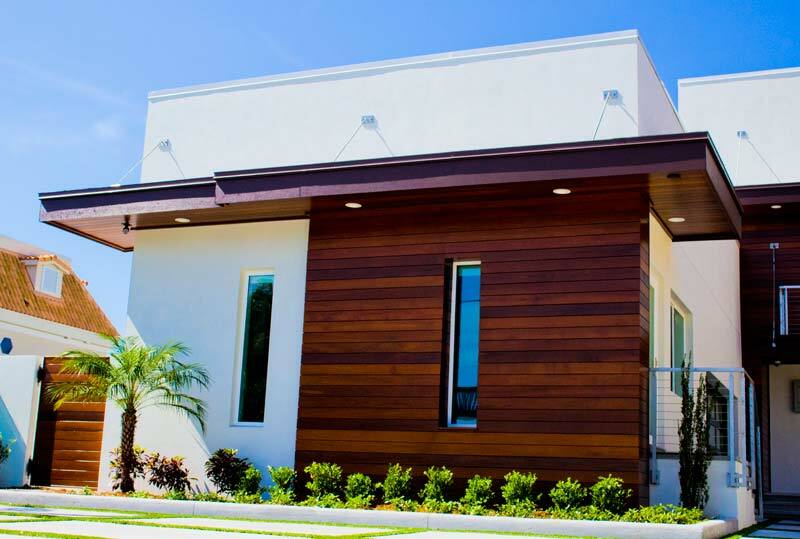 This modern home built on North Clearwater Beach utilizes the limited lot space available. 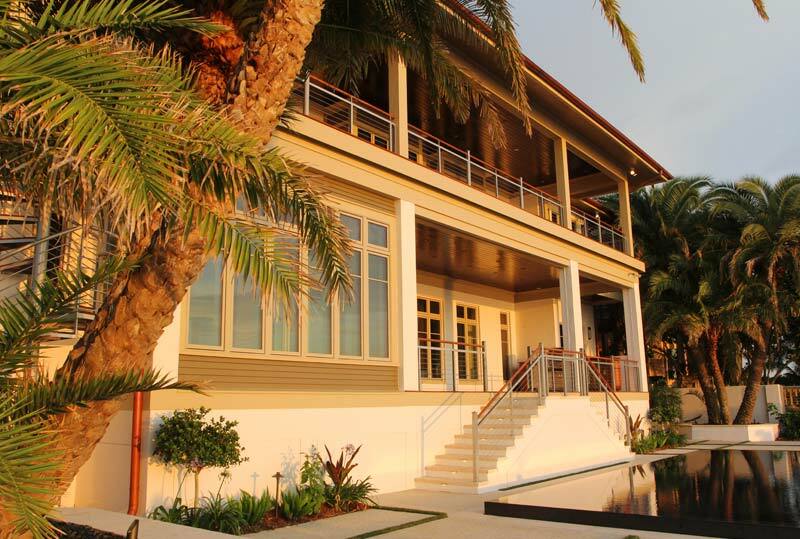 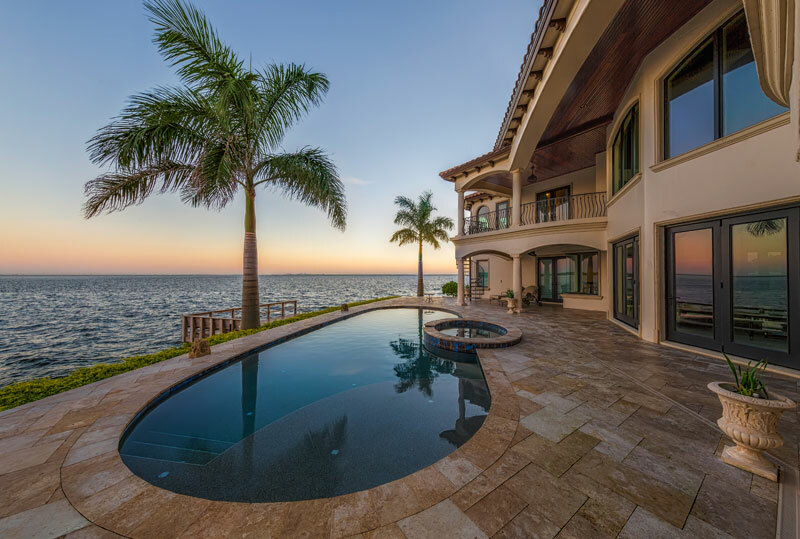 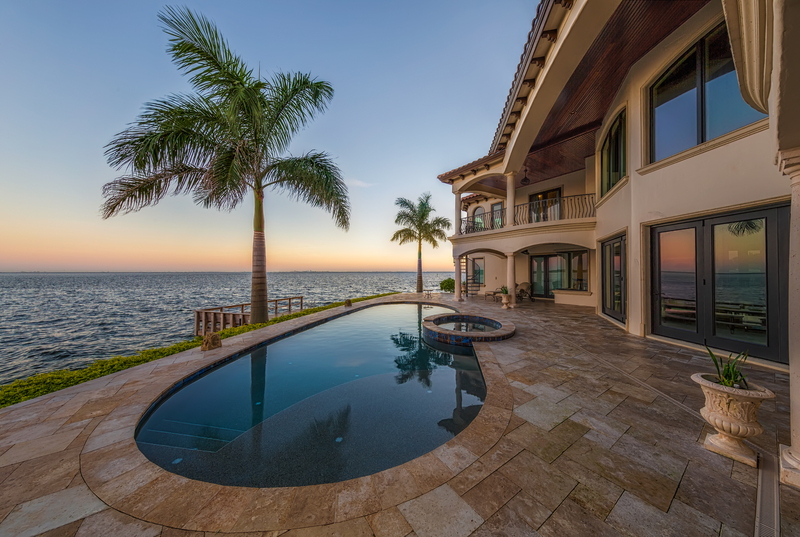 Built on the Gulf of Mexico, this home incorporates the best of natural Florida living. 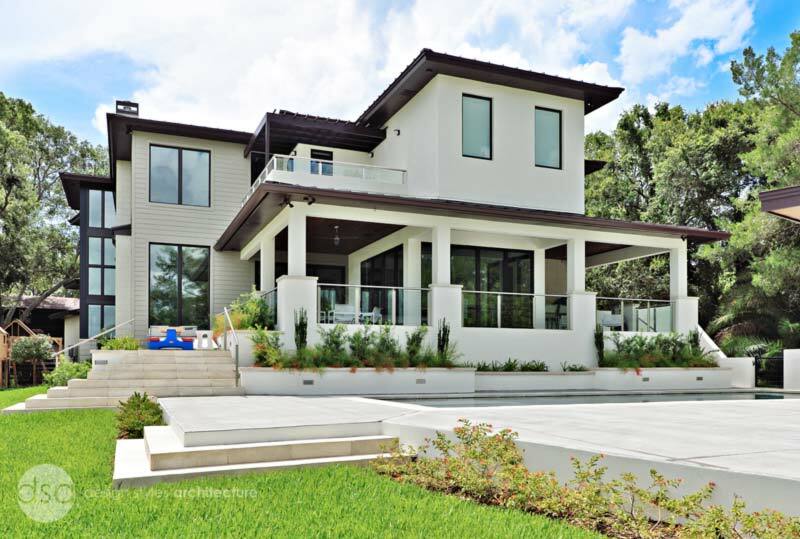 A simple, yet sophisticated, landscape palette highlights this modern home. 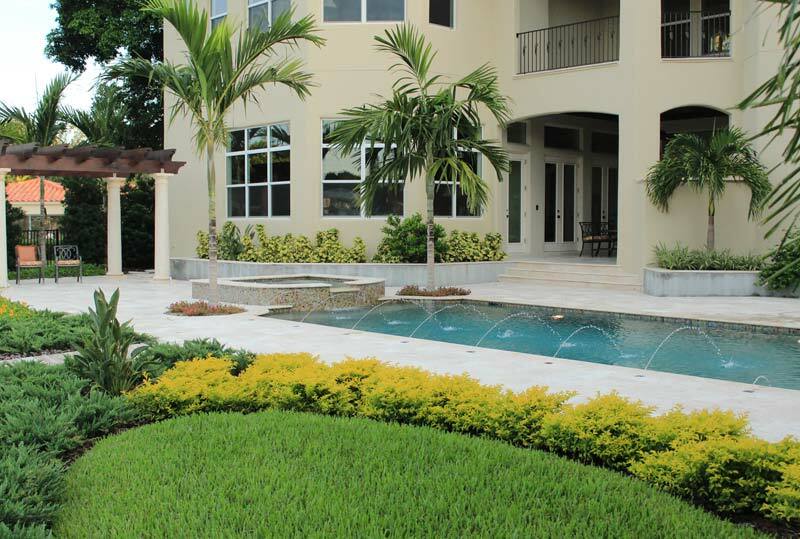 It includes a plunge pool and spa and low maintenance landscaping that looks good year-round to work with the homeowner’s lifestyle of Florida winter living. 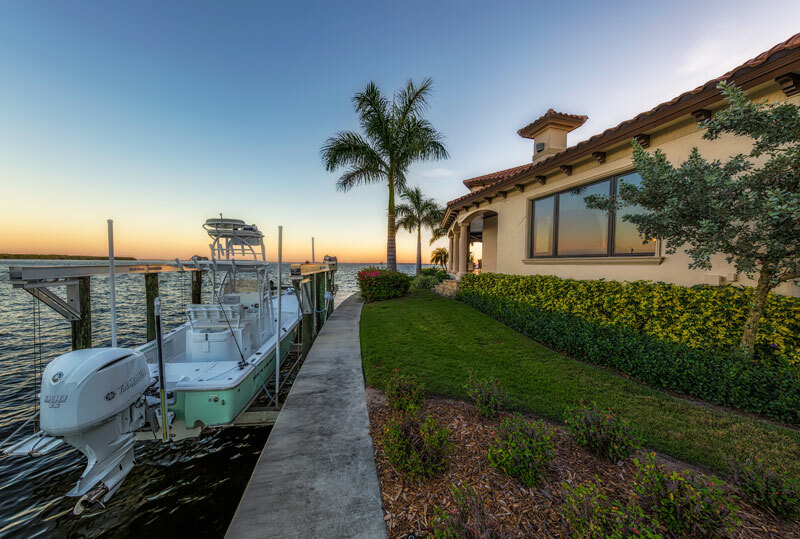 This Frank Lloyd Wright-inspired waterfront home in Dunedin includes renovated landscape, a new entry into the home with views to the Bay, and re-designed back yard. 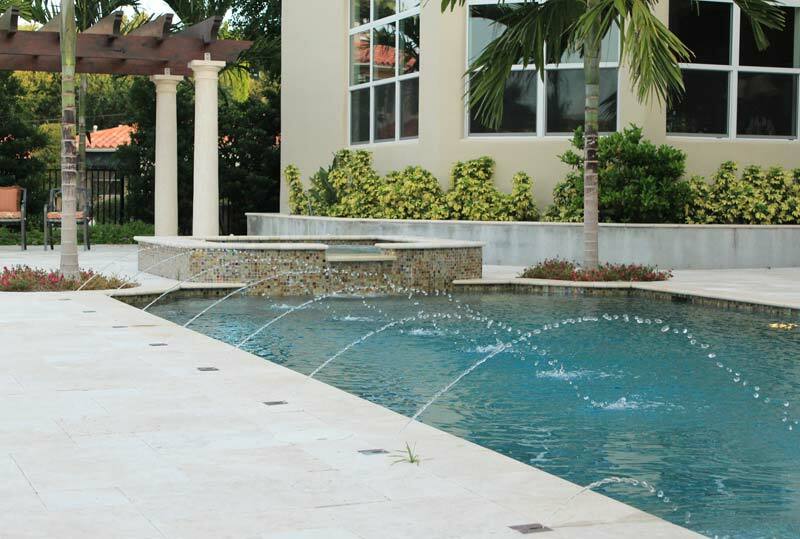 We created a waterfront seating area and outdoor living area with a unique fountain. 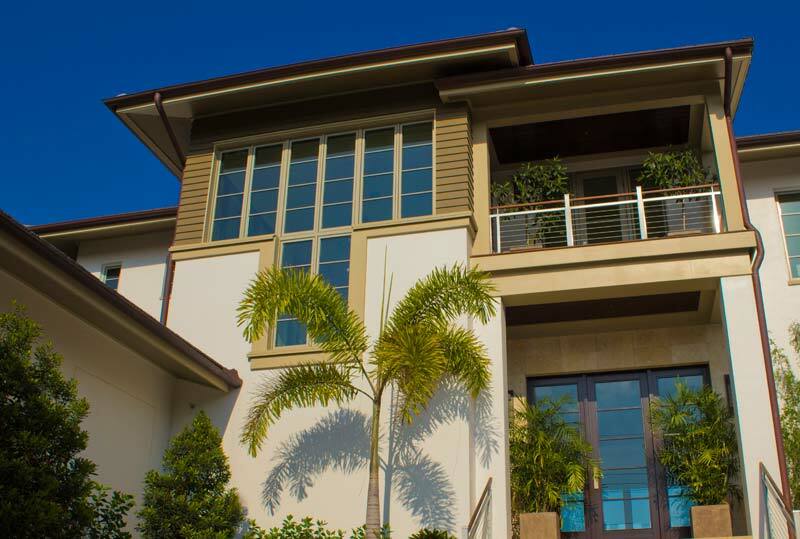 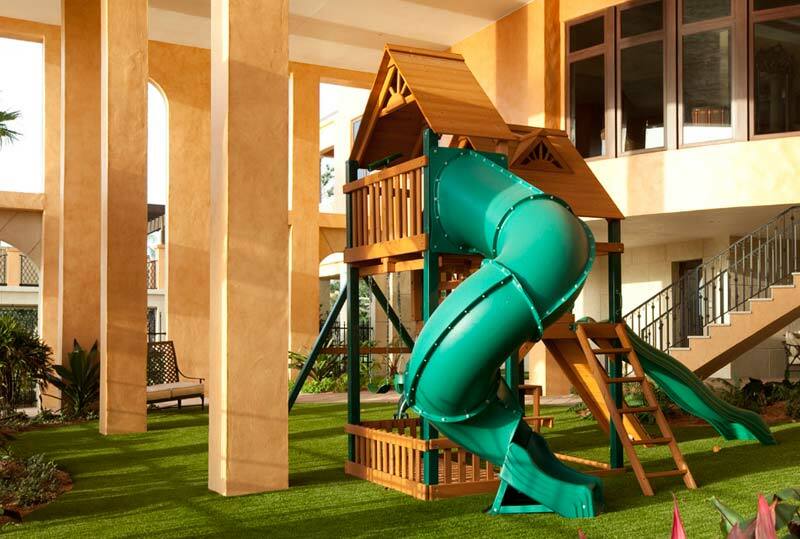 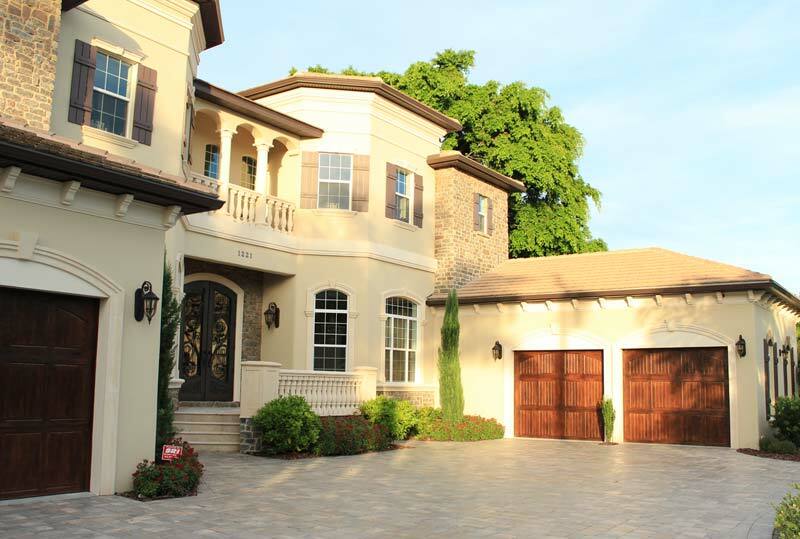 A luxuriously located lot in a Ft. Myers gated community lent itself to creative heights. 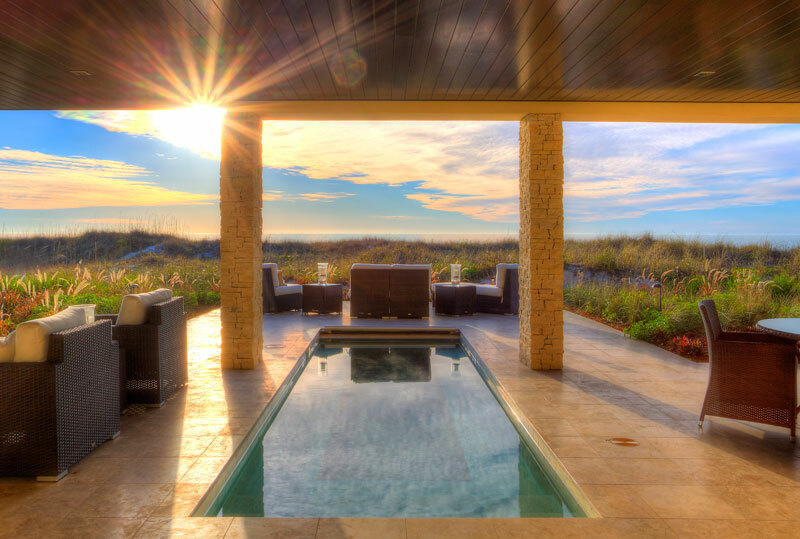 The pool and attached hot spa and cold spa overlook a lake. 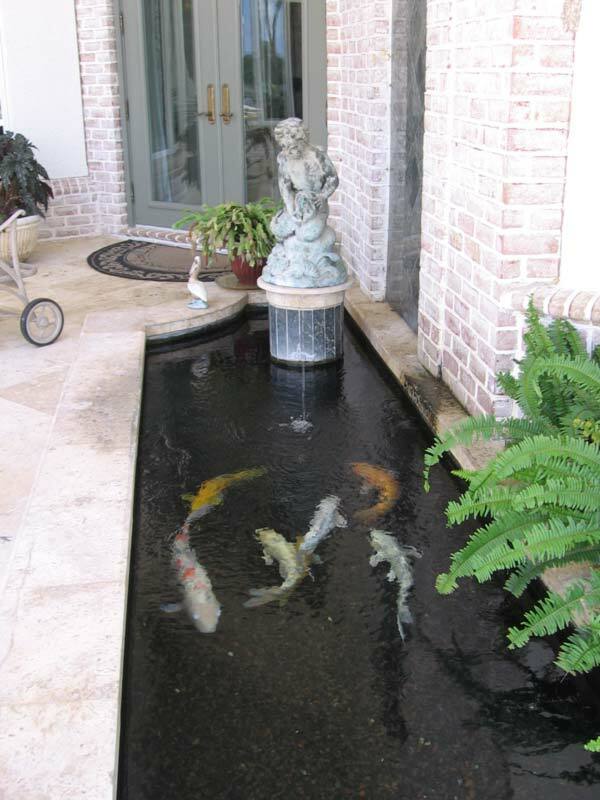 The backyard design includes a koi pond, bar, changing room, mature landscape, and travertine tile. 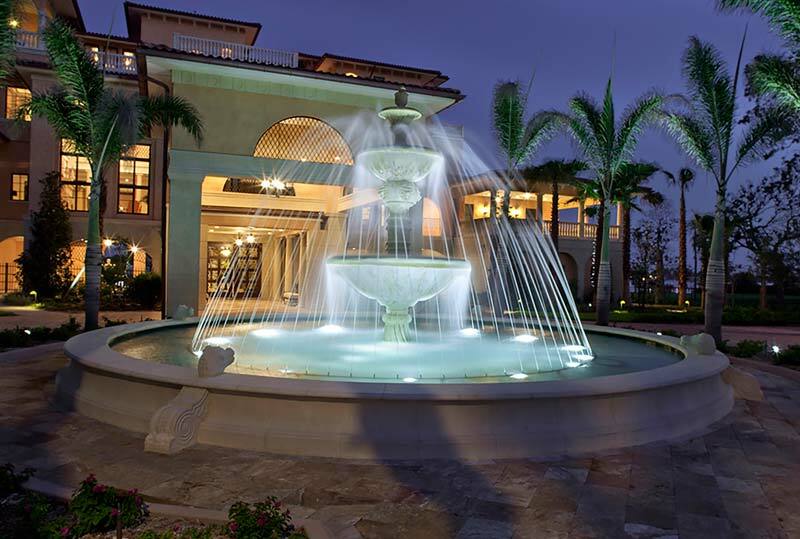 A waterfall grotto is an enjoyable way to relax in these beautiful surroundings. 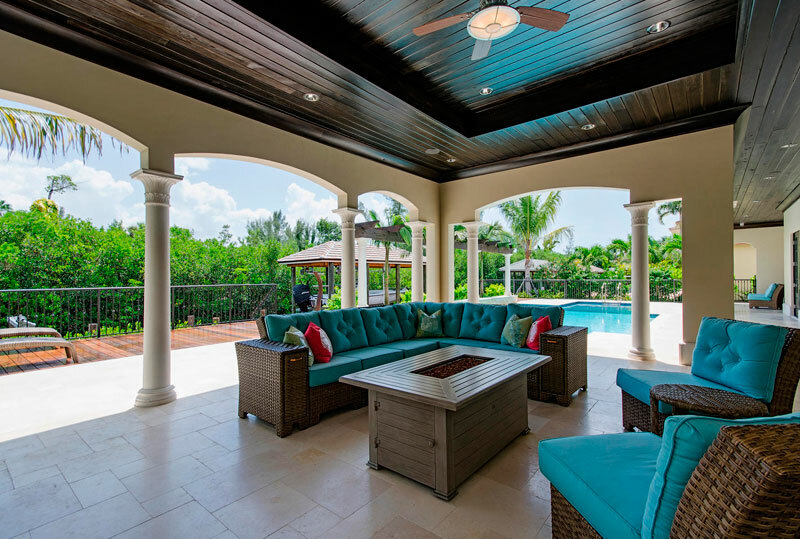 This newly built home in Ft. Myers features teak decking, a pool with spill over fountains and a tiled sun shelf and a trellis. 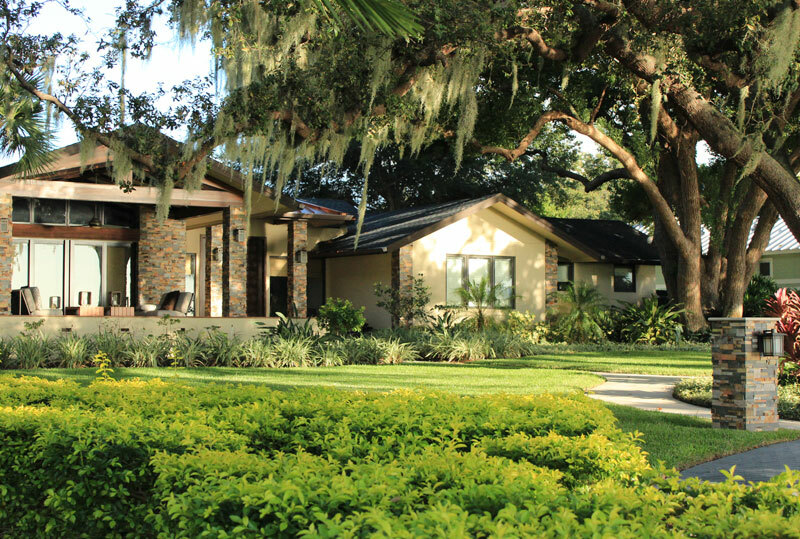 The front has a paver driveway, large trees and palms. 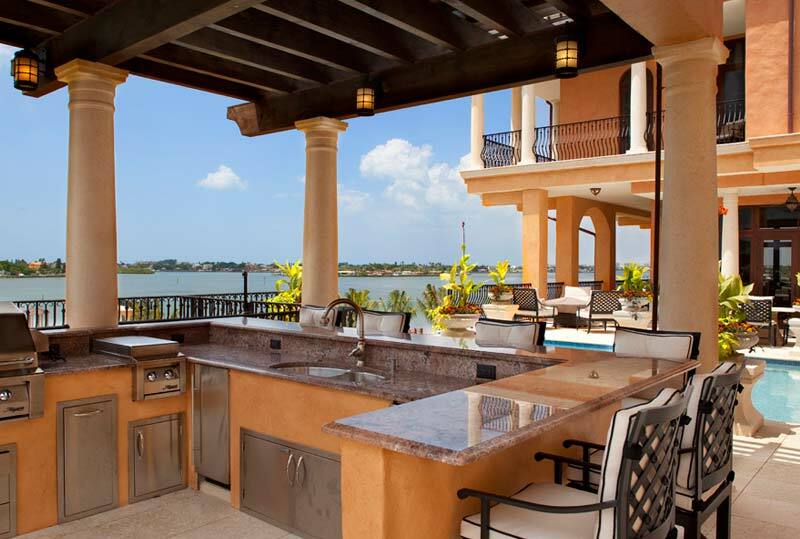 New residential construction overlooking the intracoastal waterway in Harbor B. luffs. 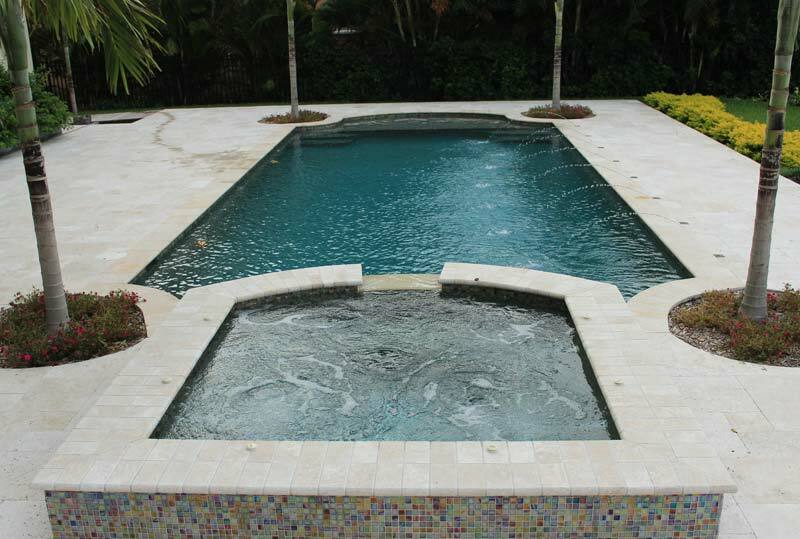 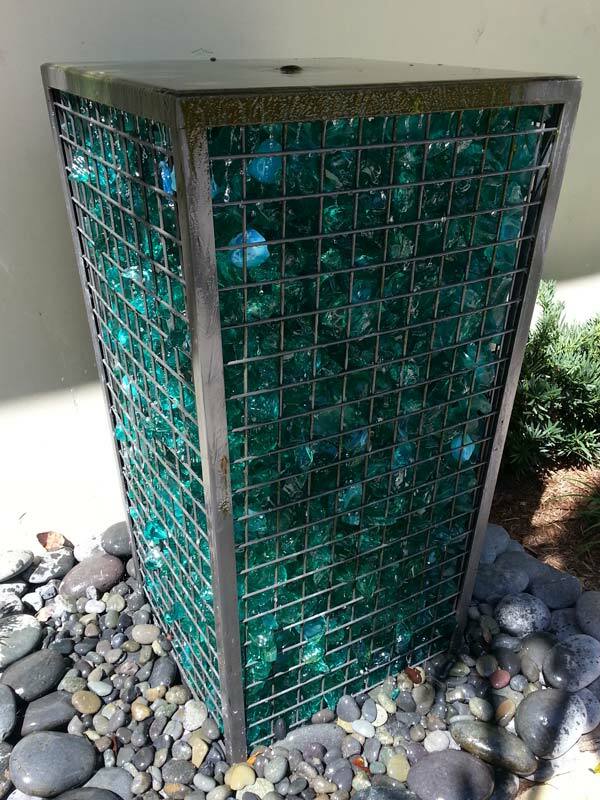 Our pool design is truly unique. 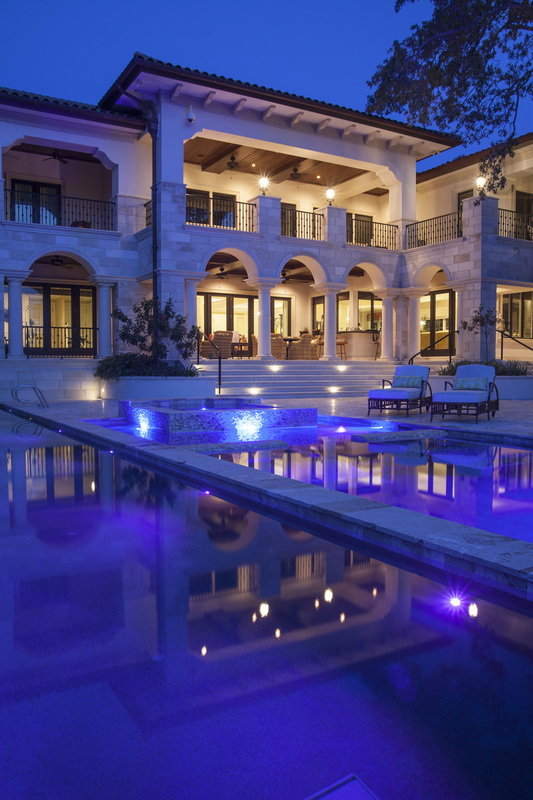 Lap pool with built-in loungers and spa. 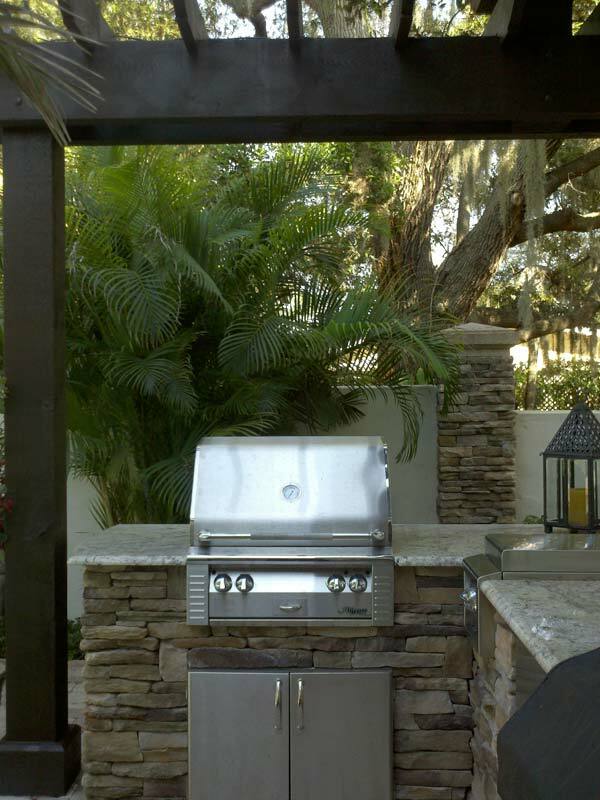 Outdoor kitchen featuring a double-sided fireplace. 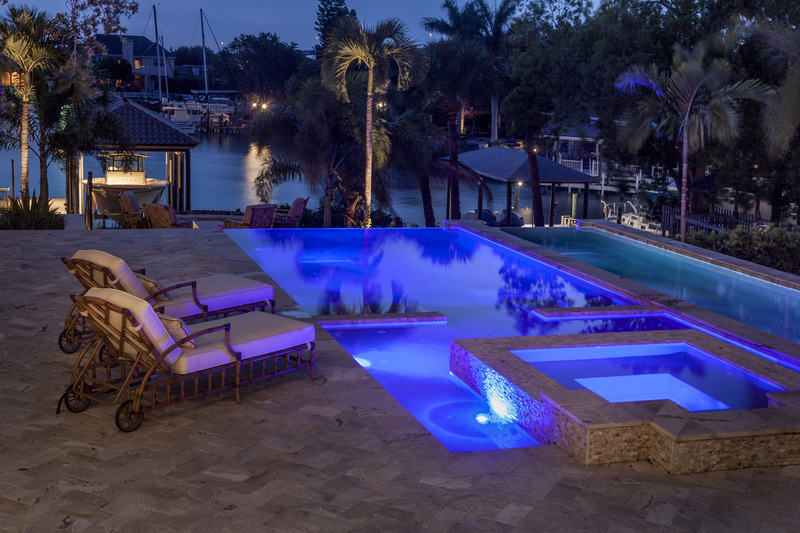 Seating area overlooking the waterfront. 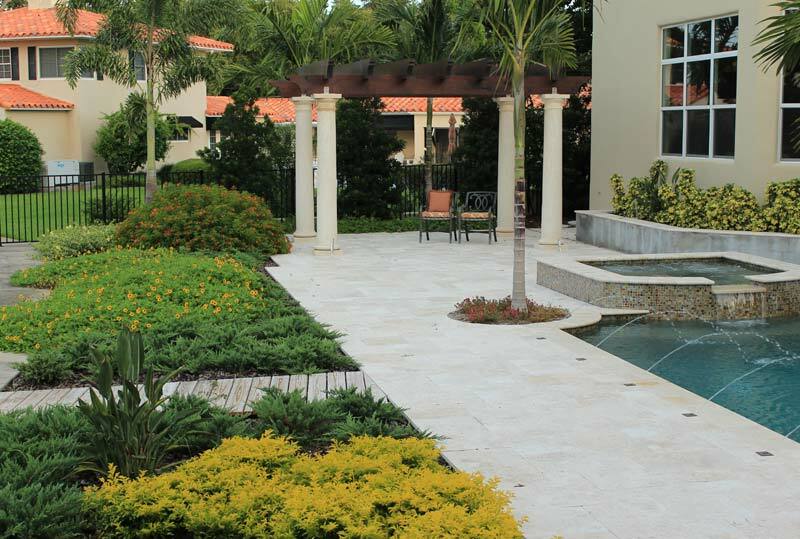 We designed all hardscapes, landscape, lighting, beach area, herb garden, fire pit and driveway. 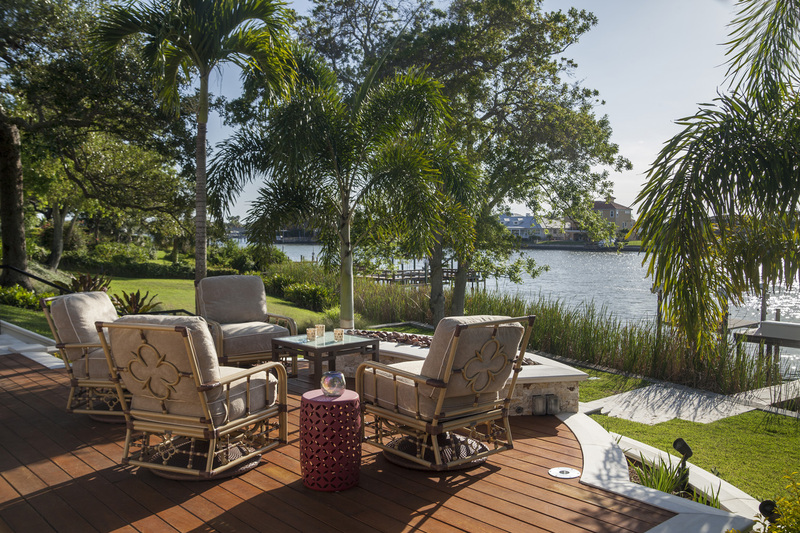 Our terracing design included 20-feet to the dock. 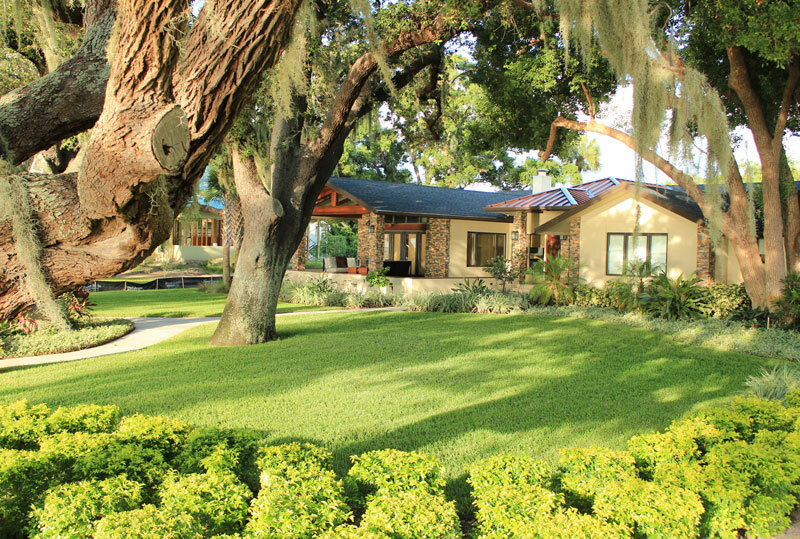 The front yard includes a four-ton rock brought in from Colorado. 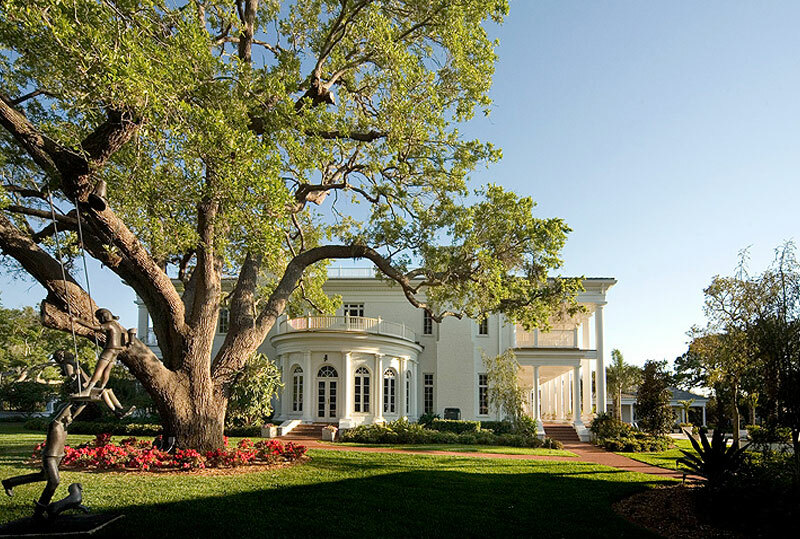 Magnolia Bluff is a grand plantation house with adjacent guest and pool houses, sitting on a 3-acre bluff overlooking Clearwater Bay. 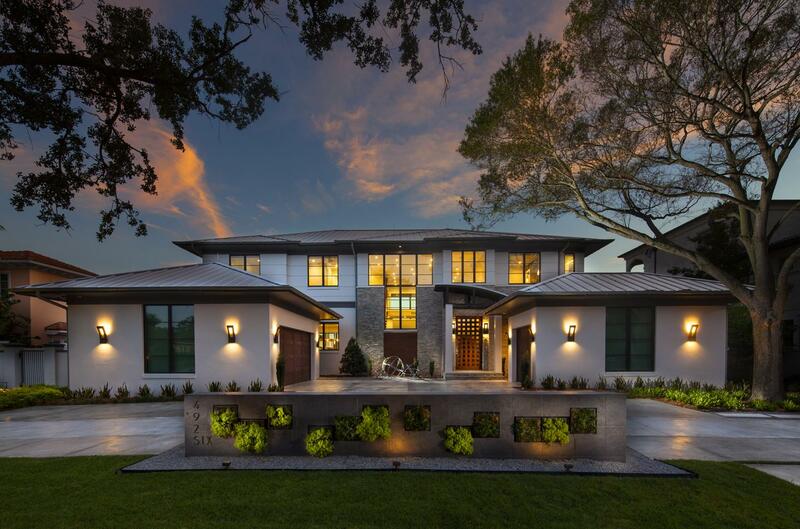 The home was sited specifically to take advantage of a magnificent unobstructed view of the bay and city skyline while preserving 100-year-old oaks, and raising the ground elevation to hide a neighborhood street at the foot of the bluff. 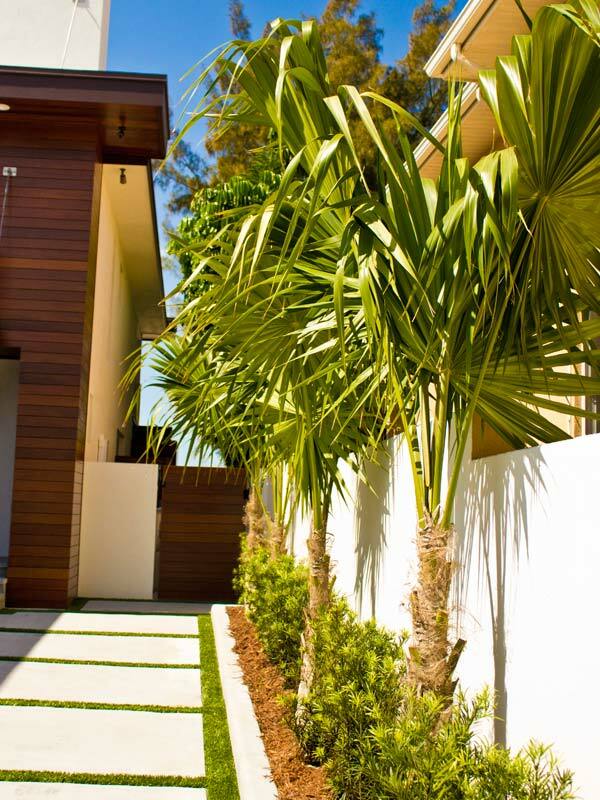 This modern home needed modern landscape, as well. 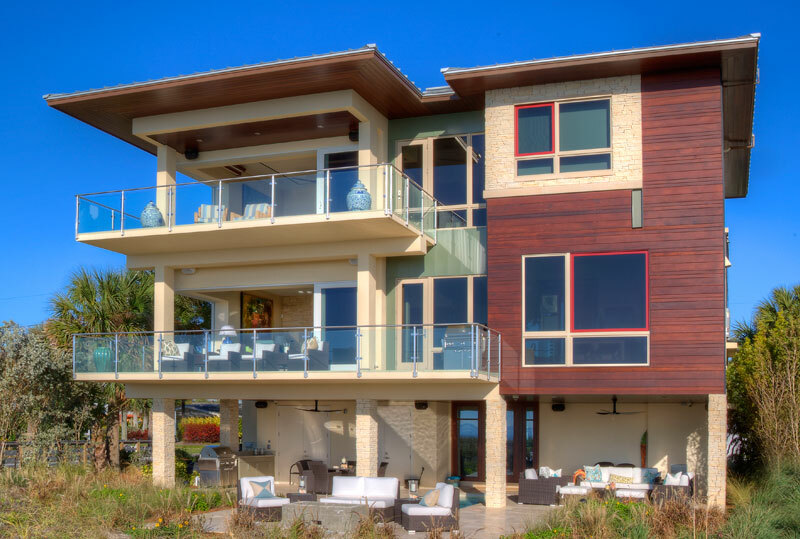 Lines and angles are important. 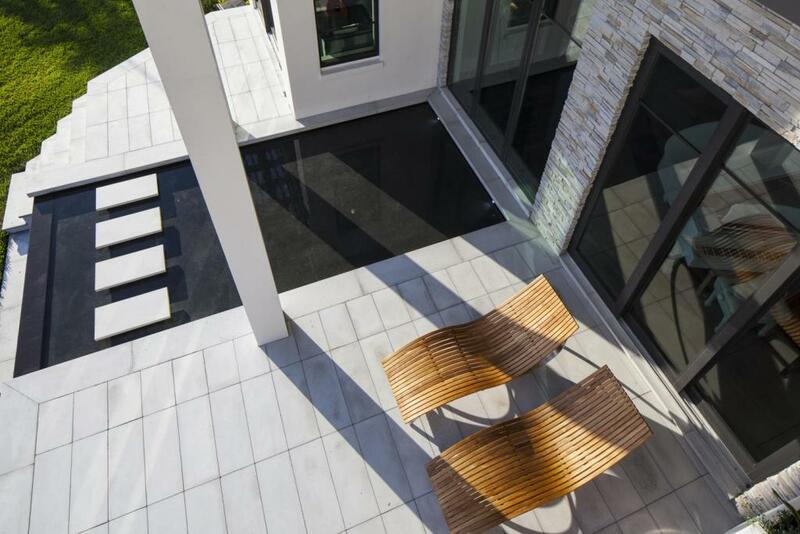 From the vertical mother-in-law tongue to the linear plant bed designs and pavers, the house calls for landscape and hardscape design to follow suit. 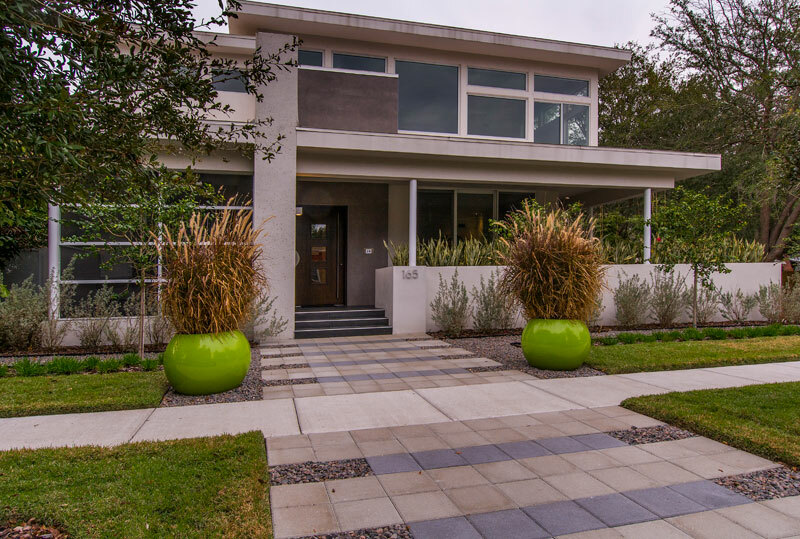 At the same time opposites attract, so the bulbous planters and other circular designs attract the eye and add character to the home. 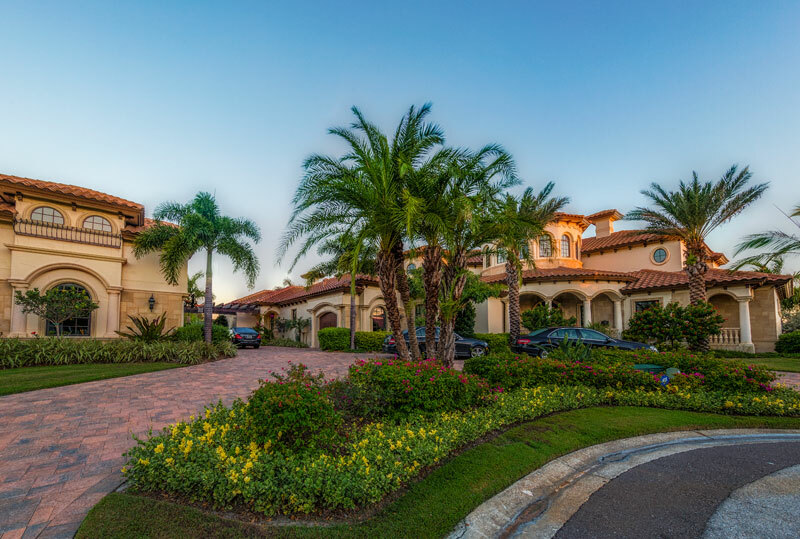 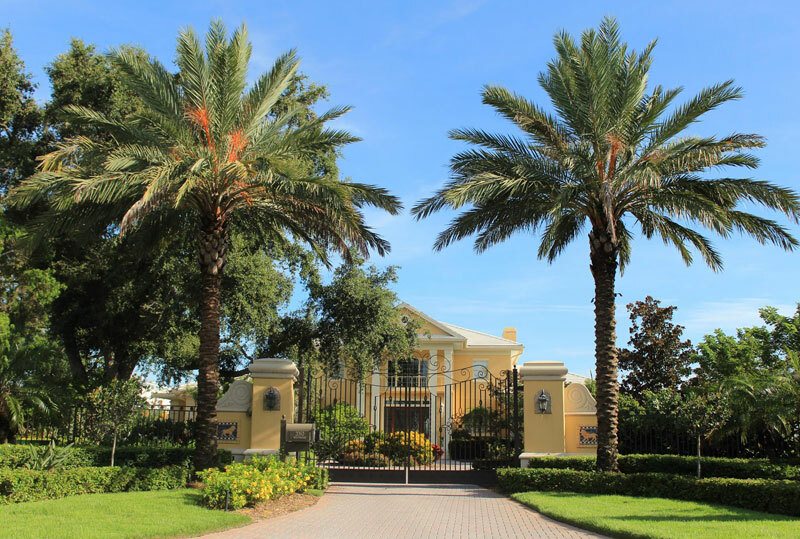 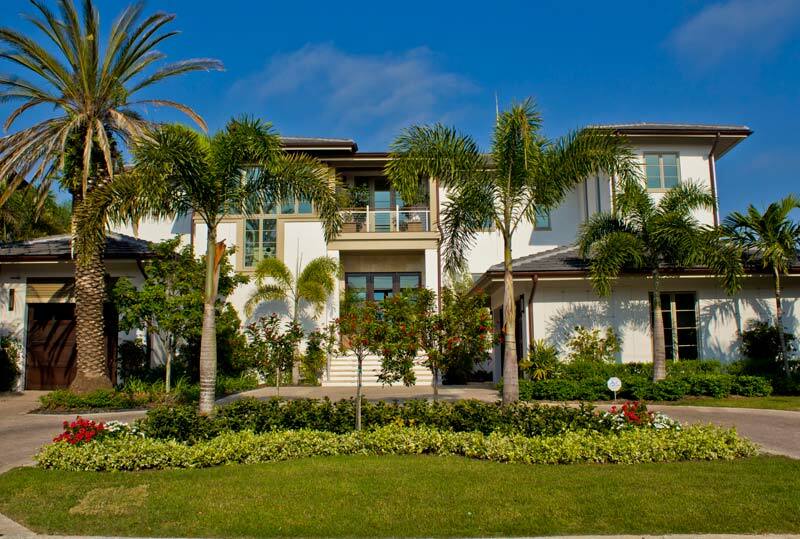 This 4.5 acre intercostal residential property is the setting for an amazing Tuscan inspired home. 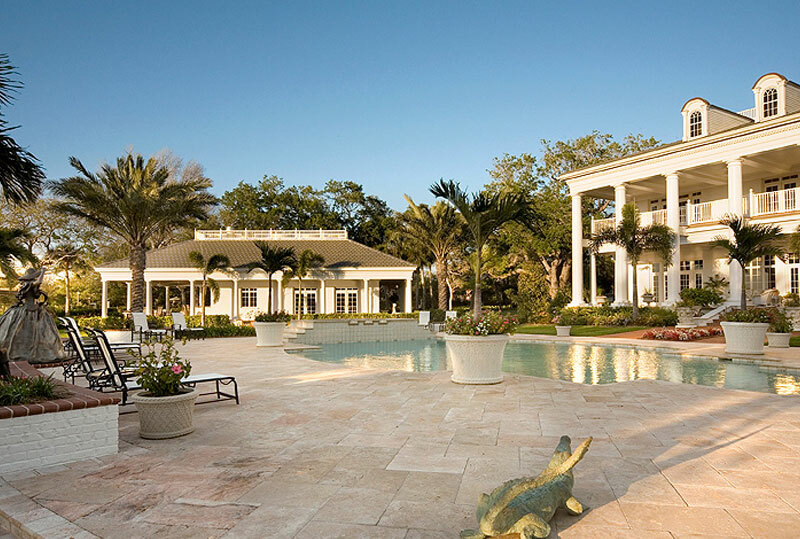 Approaching the four-story home, a large three-tiered fountain, complete with a spray ring of precast molded alligator heads, adds to the ambiance. 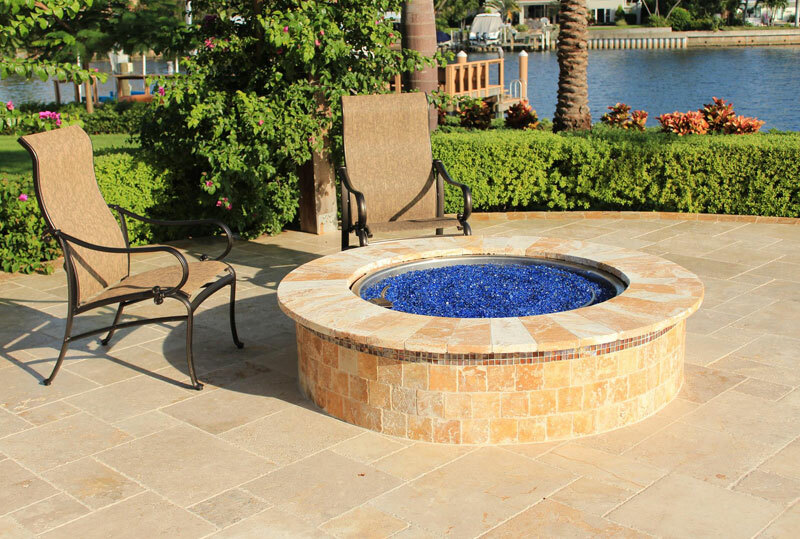 A large fire pit punctuates the outdoor patio adjacent to the pond while the floating programmable fountain provides a unique show with different spray patterns and color changing lights. 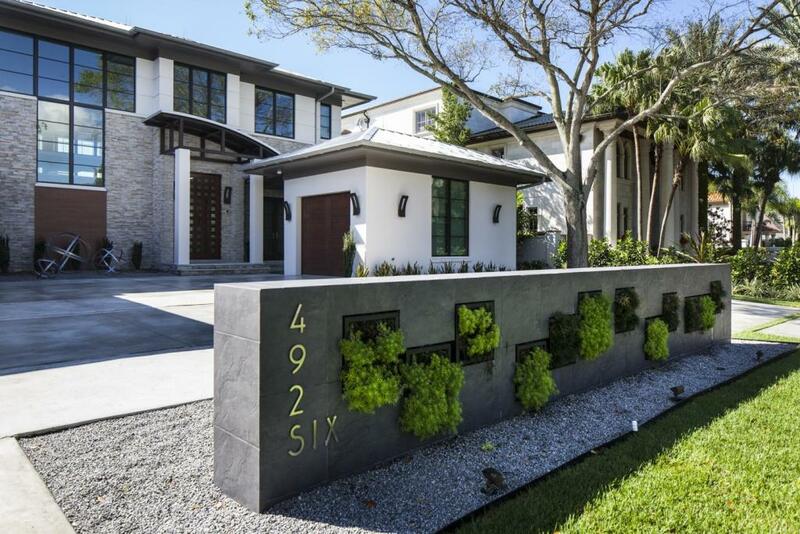 This private residence on Redington Beach features a modern design with an intricate grass joint driveway. 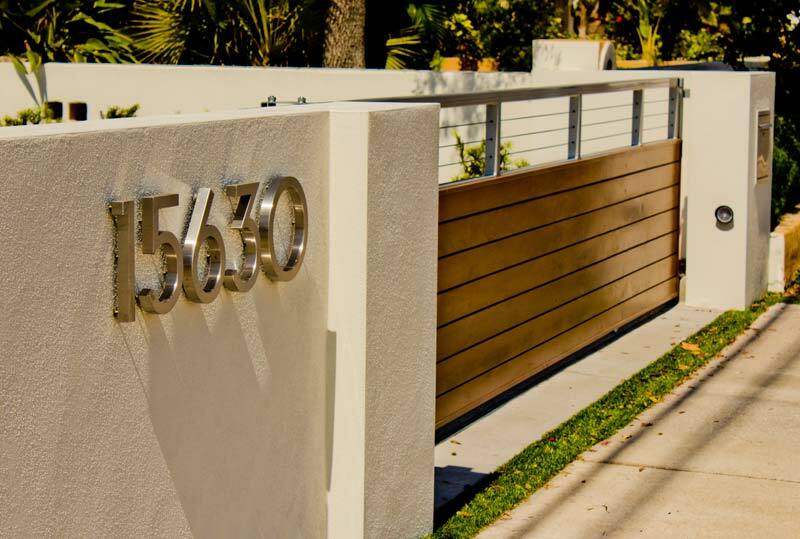 Though lots are small, the landscape architecture packs a powerful punch with the wood and metal driveway gate, planters lining the property line and pavers for clean lines. 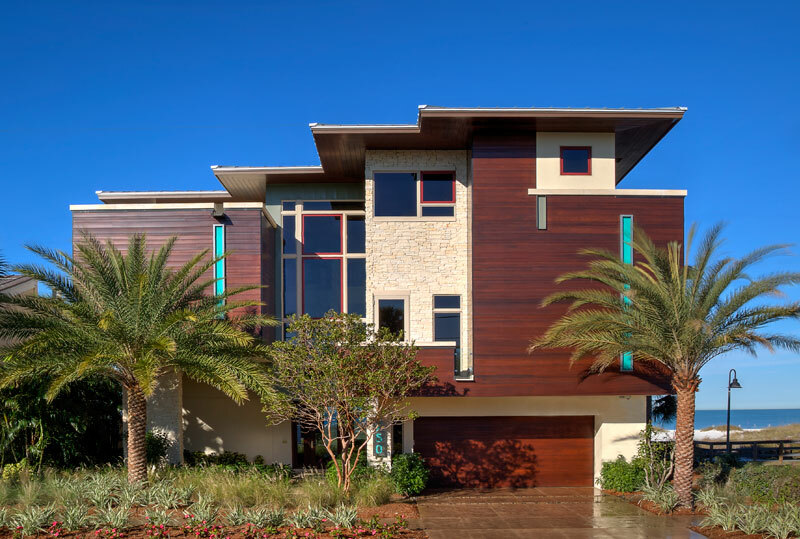 The back overlooks the Gulf of Mexico, with clean lines directly to the beach view. 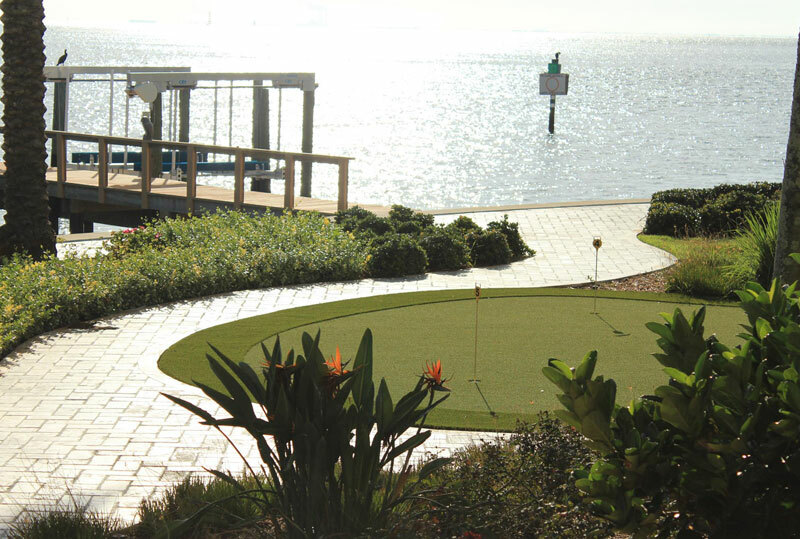 A beautiful home on the waterfront is bounded by an extra lot the homeowner wanted to convert into a fun area for kids and guests so we designed a mini golf course. 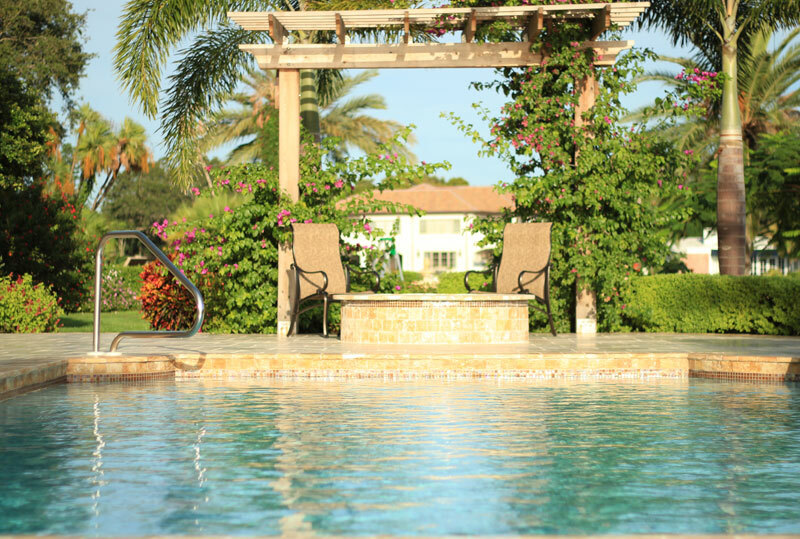 We re-designed the pool, and added a fire pit for another amenity for company. 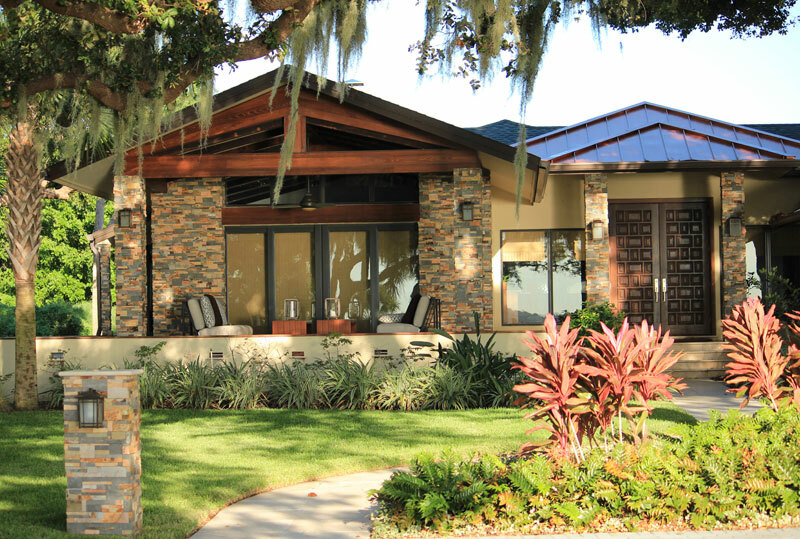 New landscape over the entire site gives it a fresh feel. 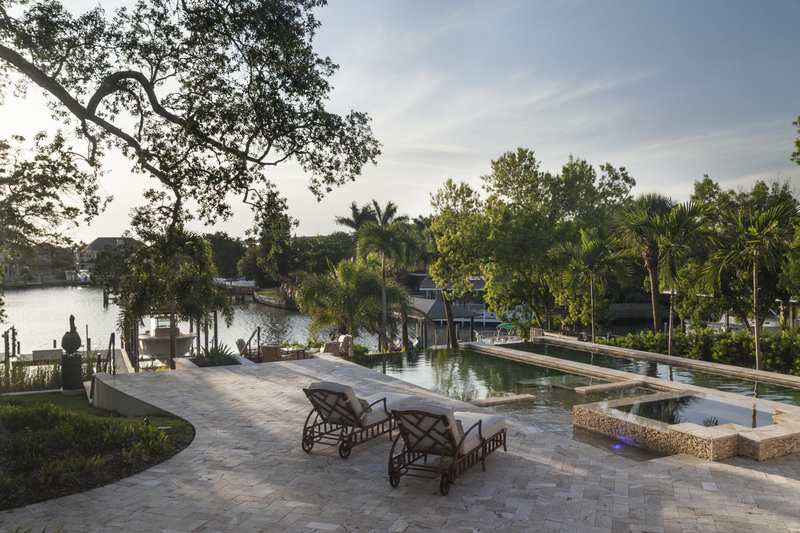 Located in Snell Isle, this Bermuda-inspired home includes a lagoon pool finished with North Carolina cherry log boulders that spill into the pool while specimen palms and shrubs provide instant privacy and a tropical ambiance. 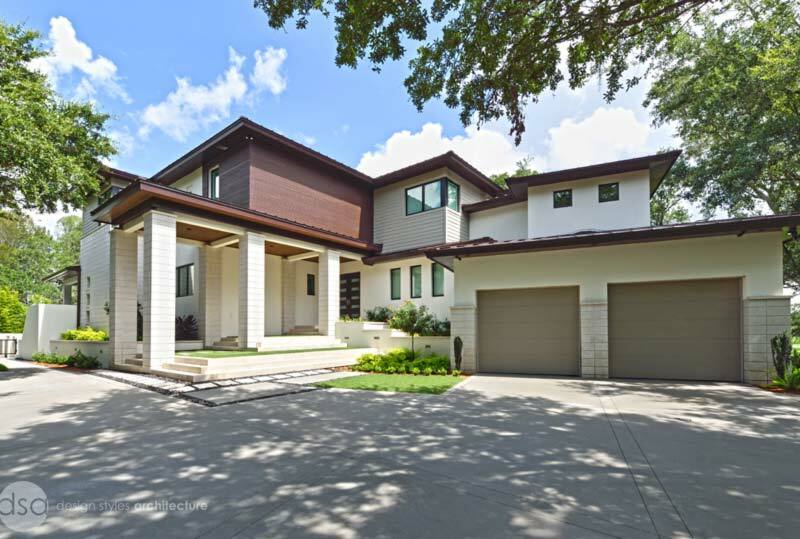 The front of the house has a heavy timber trellis feature over the garage to add architectural interest, while a gate, front porch, and patio provide extra security and private relaxing space. 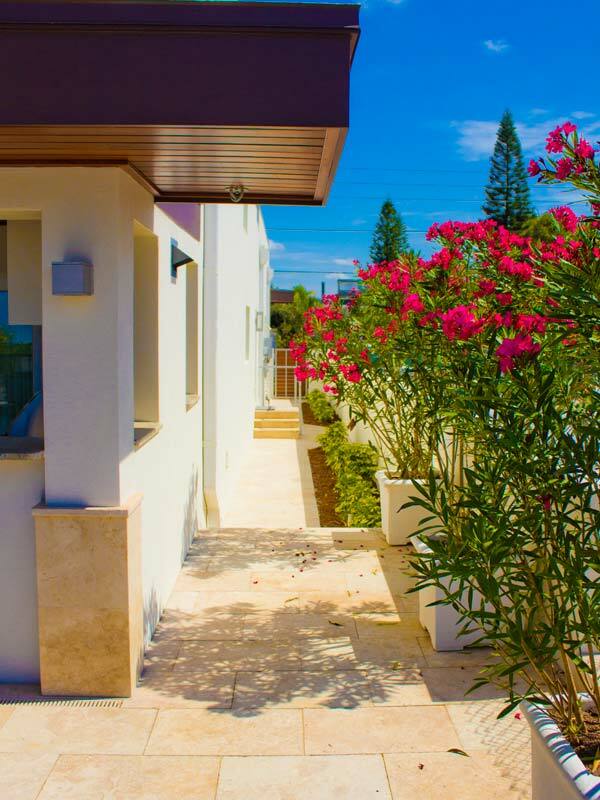 We created a vegetative buffer between the residence and the street with Potocarpus punctuated with stone columns. 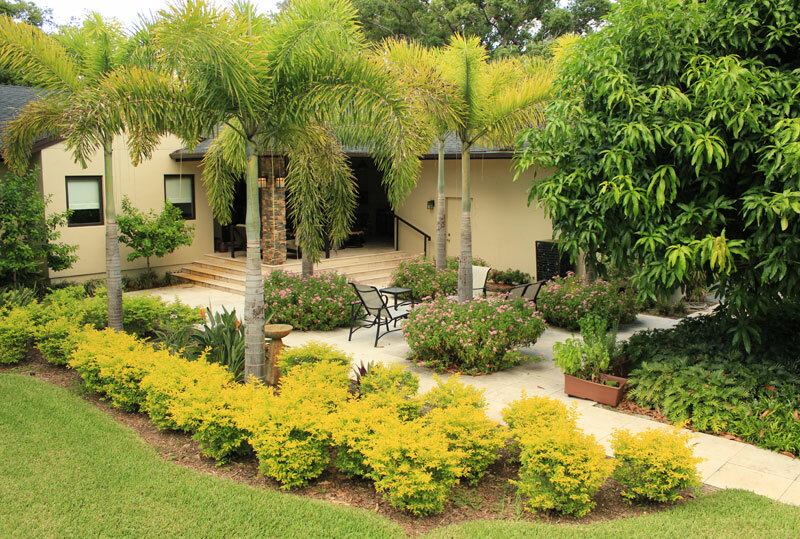 The circular drive is centered with a Reclinata Palm. 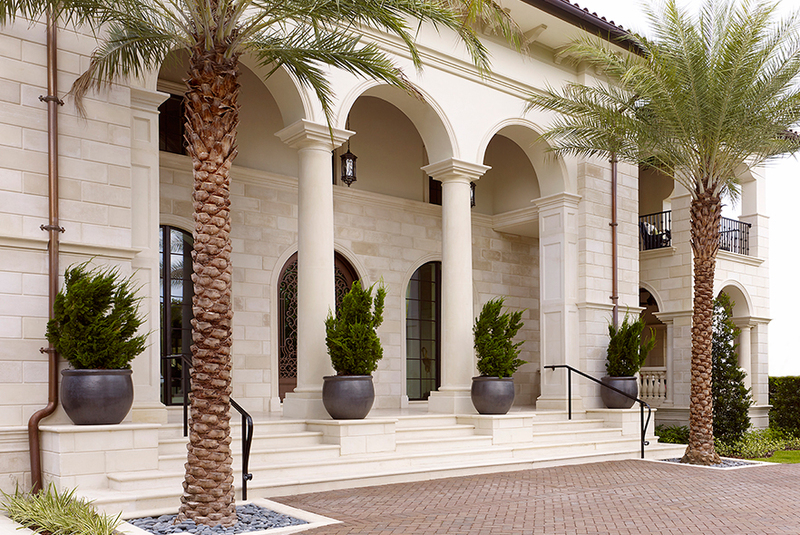 We complemented the architecture with stately Italian Cypress. 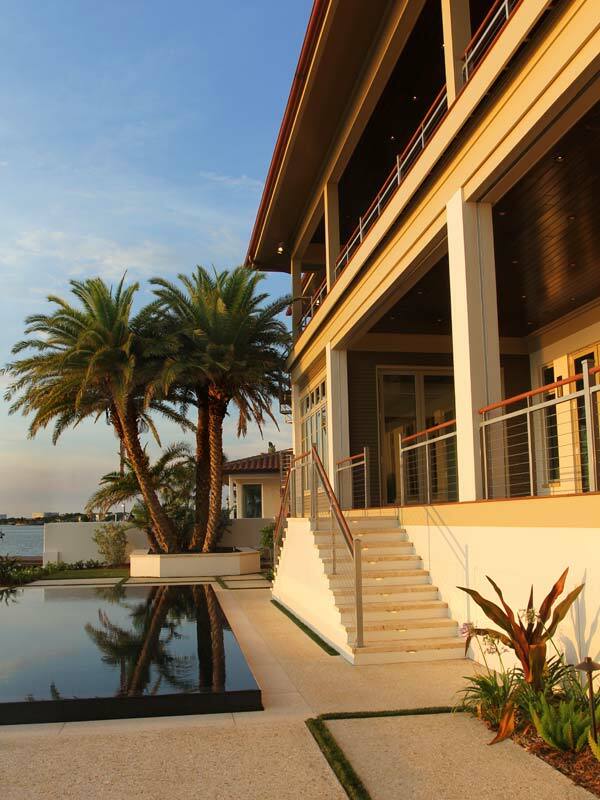 In the back, we transitioned the house from the pool to the dock with terraced planters. 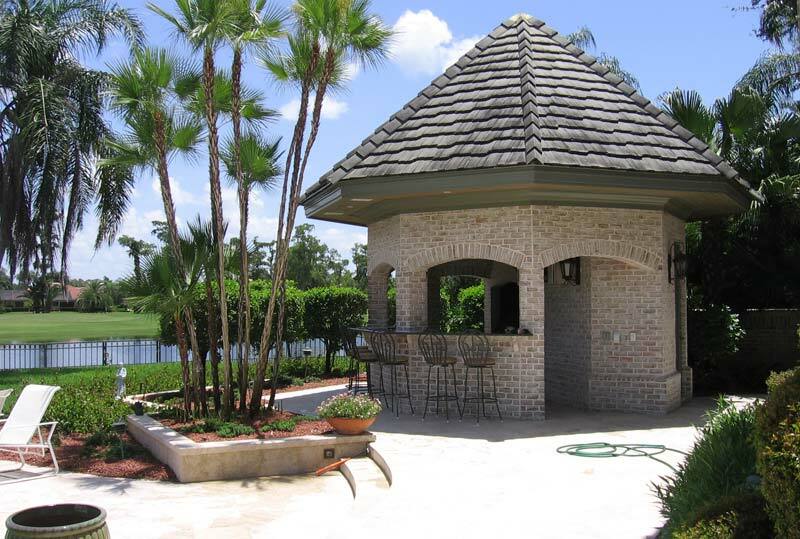 We created an arbor setting near the pool with views down the canal. 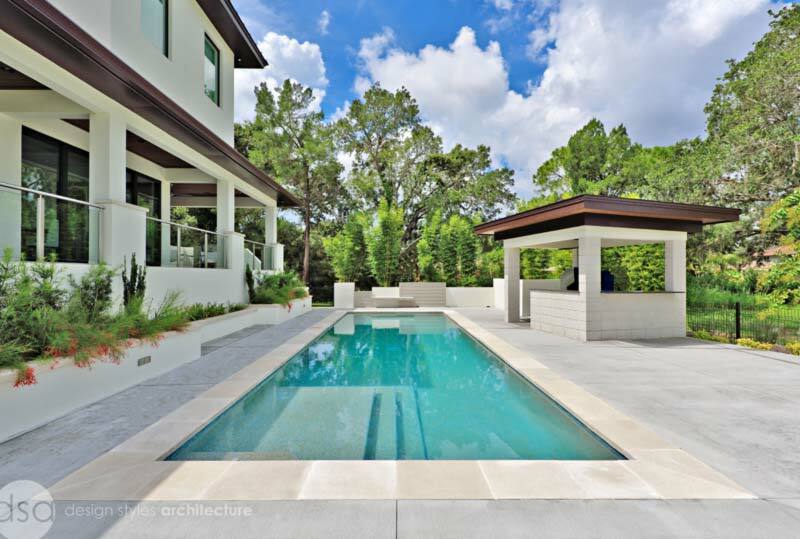 This home on Tampa Bay features a dark bottomed pool with raised zero coping, a disappearing edge and dark interior. 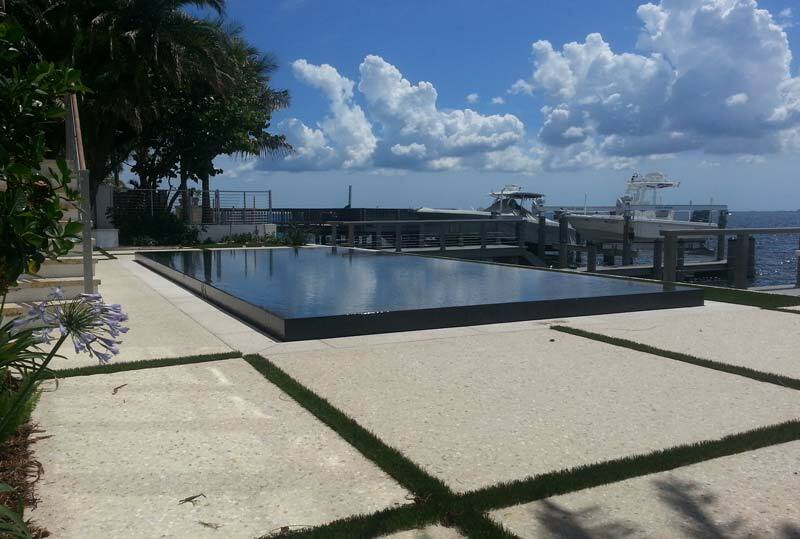 The sea wall matches the pool deck which includes an award-winning design with the artificial turf. 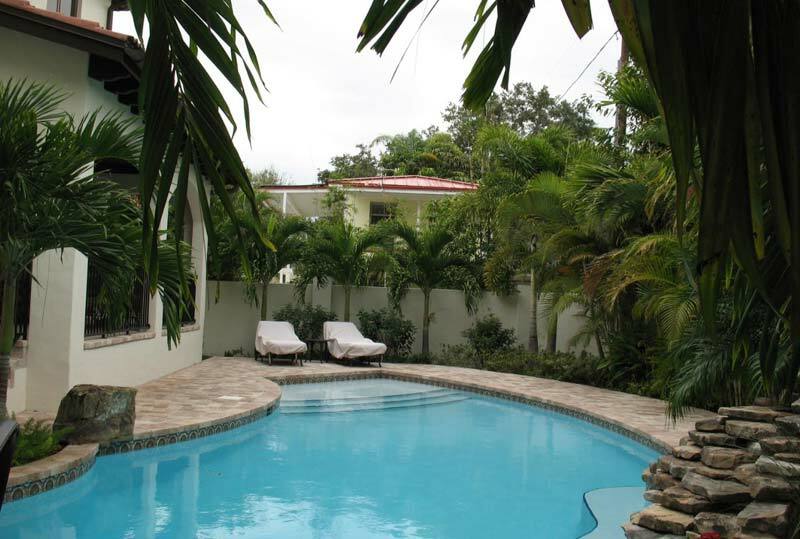 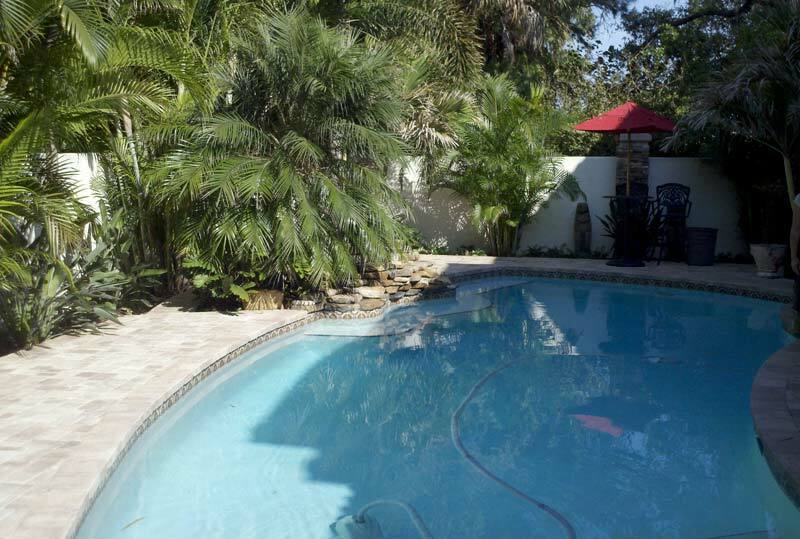 A small backyard is maximized with tall palms, colorful bushes and a beautiful pool. 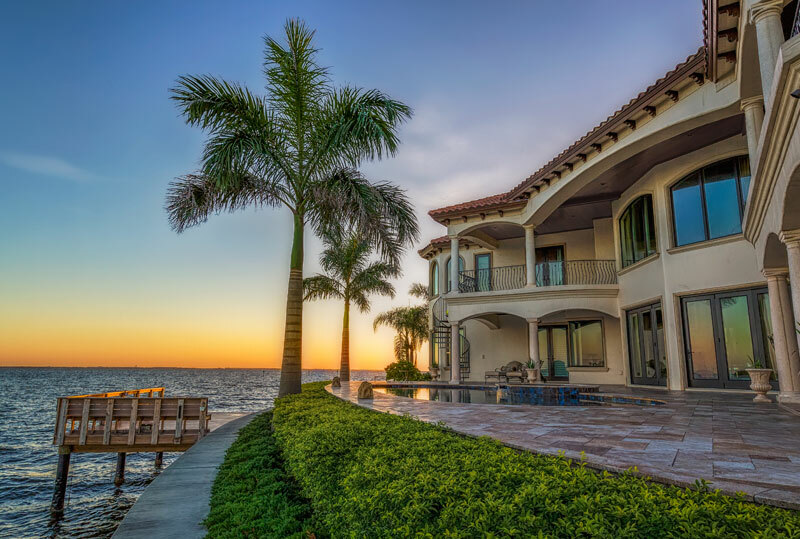 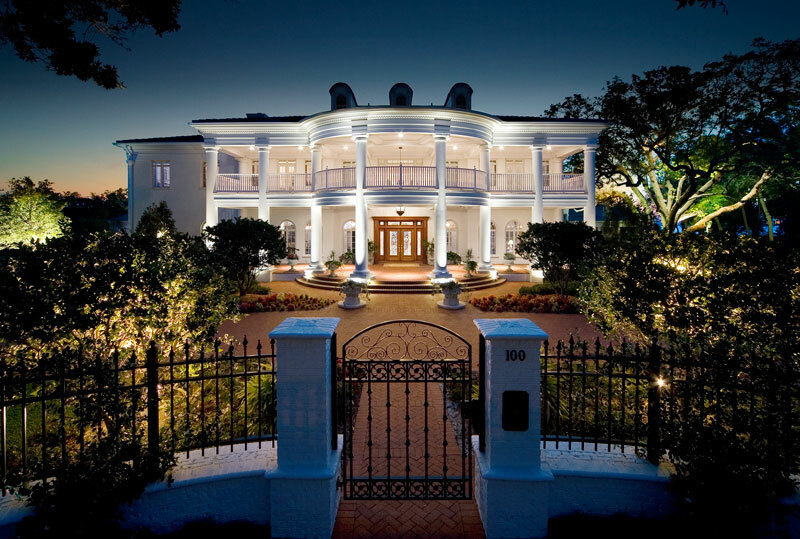 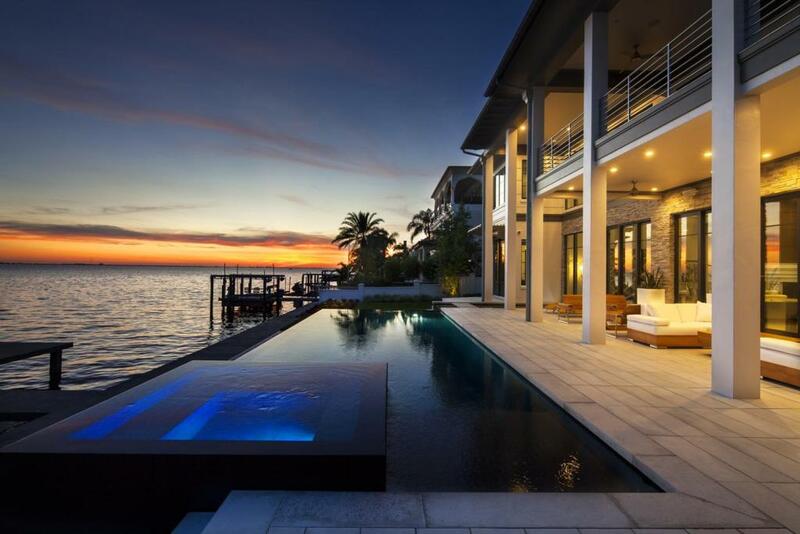 A stunning home on Tampa’s waterfront. 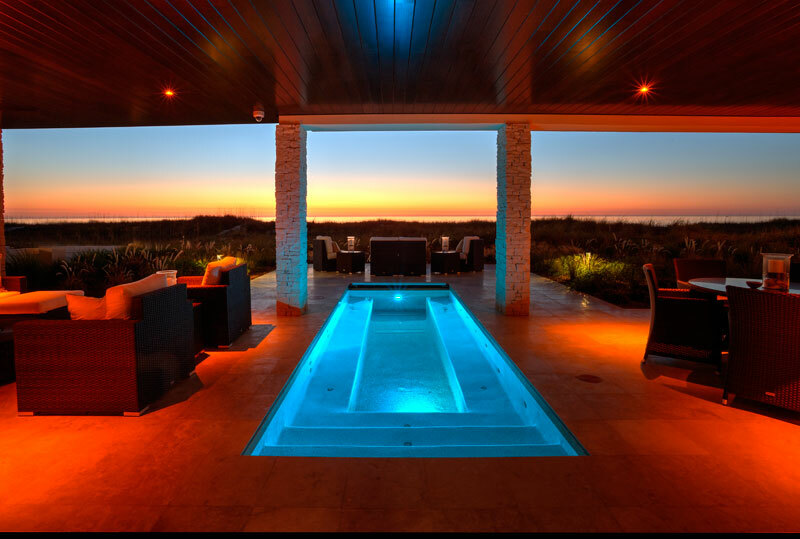 Beautiful zero coping pool with night-lit spa. 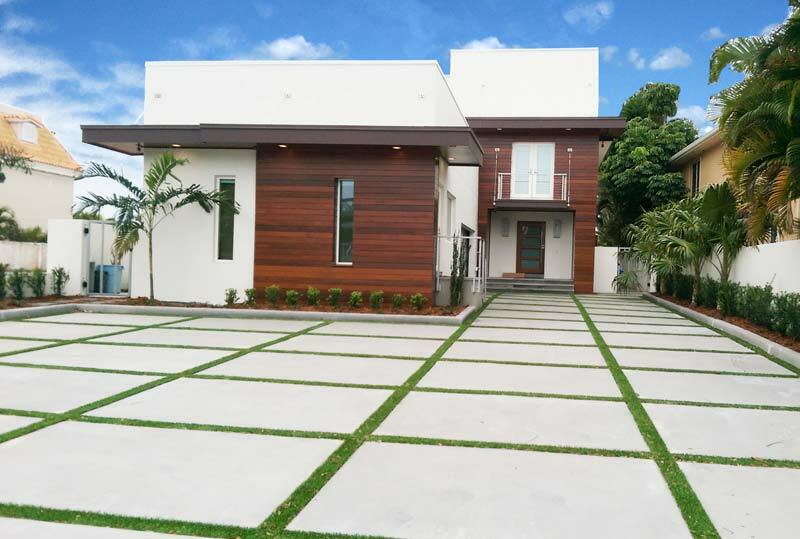 A living wall in the driveway highlights the uniqueness of the house. 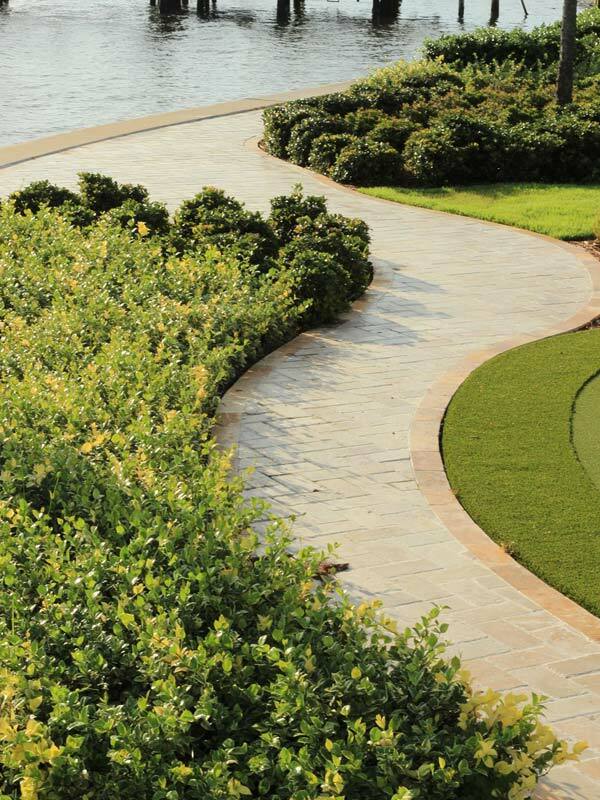 The driveway is colored concrete with grass joints and multiple finishes and colors. 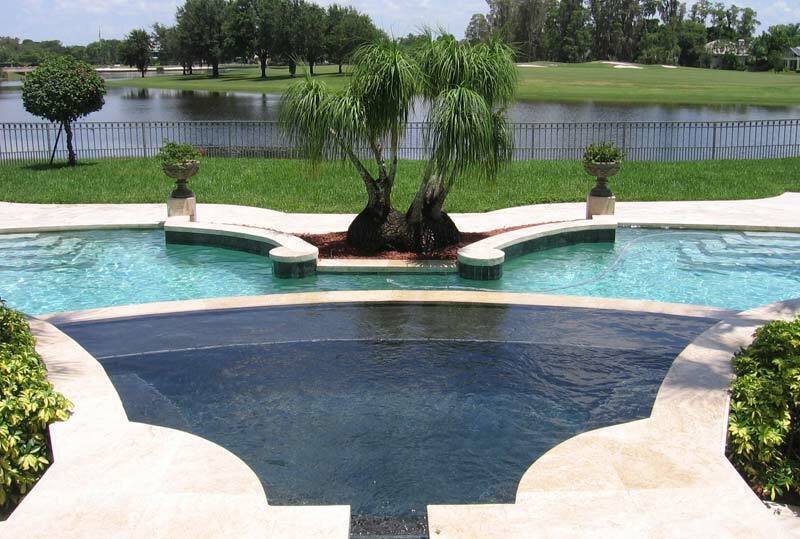 Walk in the front door and you get a direct view to line of sight black-bottomed pool. 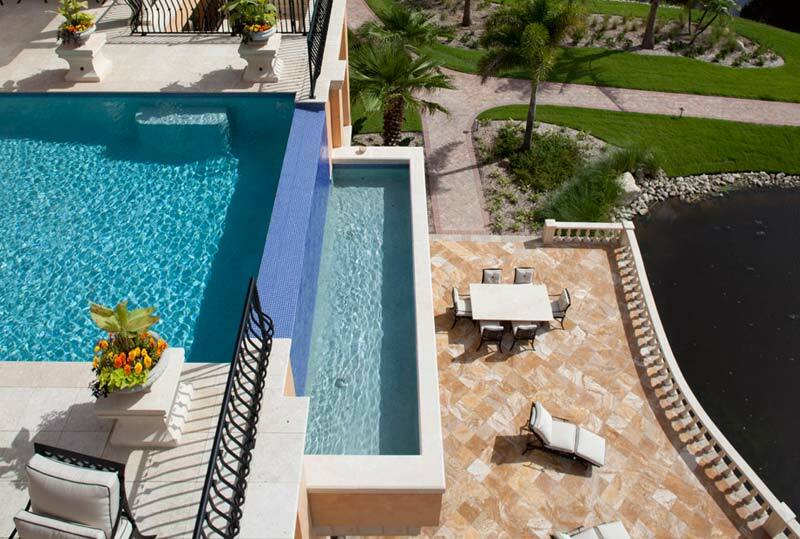 This spills into the larger pool. 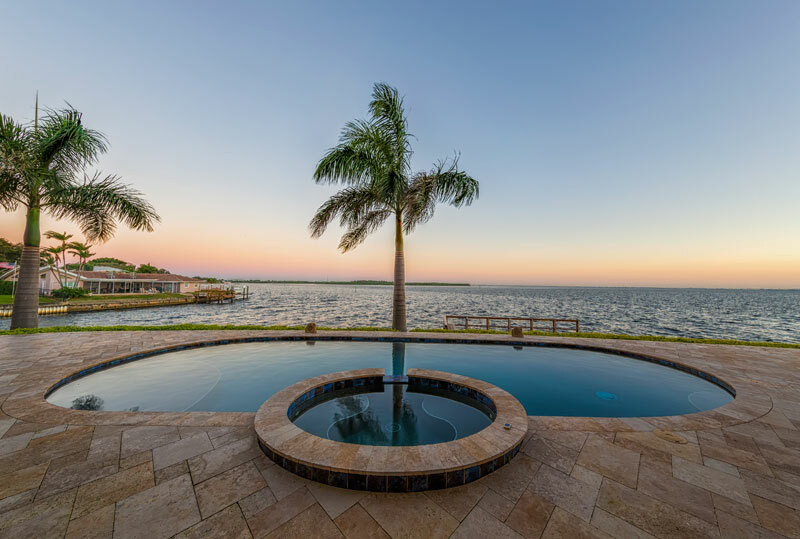 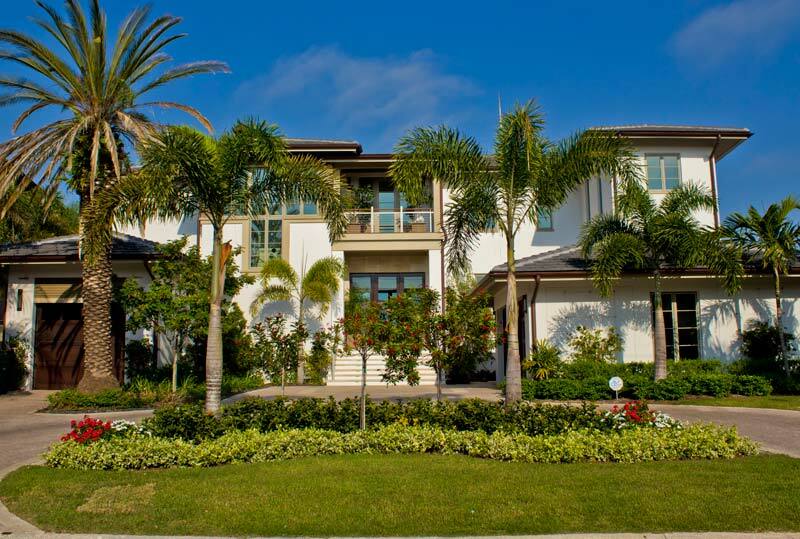 This magnificent home, located on a double lot overlooking Weedon Island Preserve in Tampa Bay, features a paver driveway, beautiful deck with elevated pool and spa, date palms flanked with Alexander palms and zoysia grass. 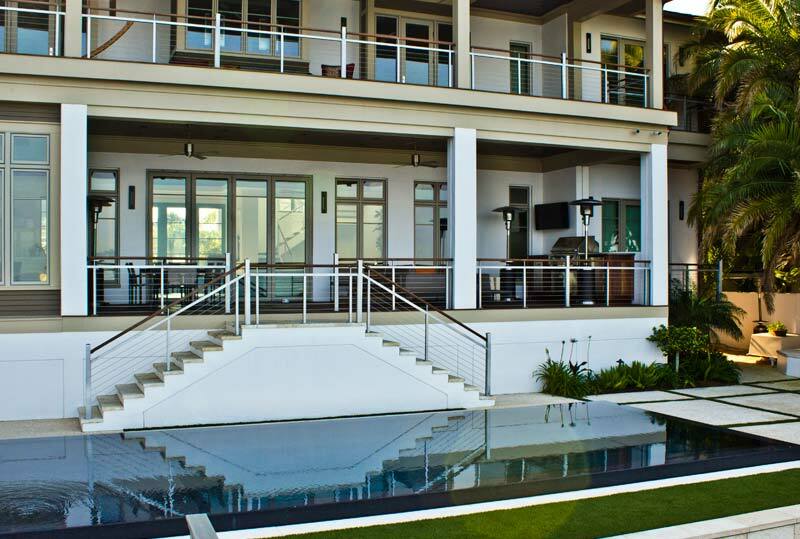 The expansive back terrace lends itself to large gatherings and entertaining visitors and guest. 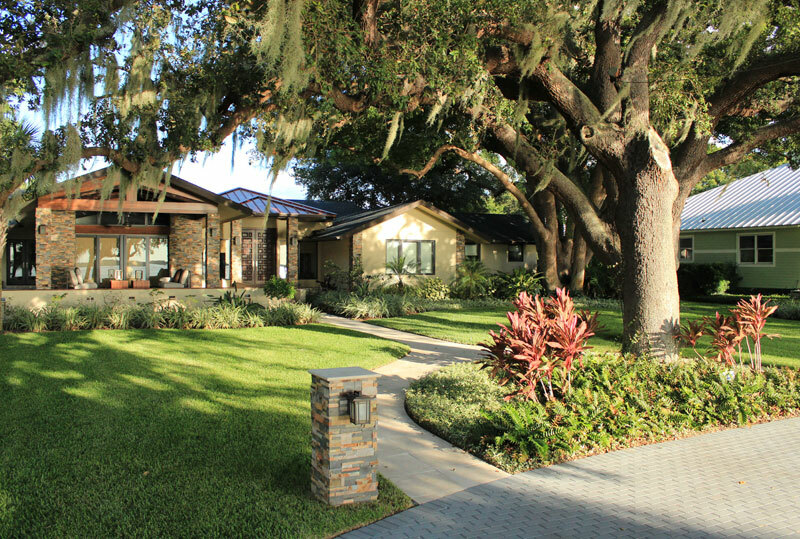 A wood arbor and continuous pavers draw the detached guest house into the main house. 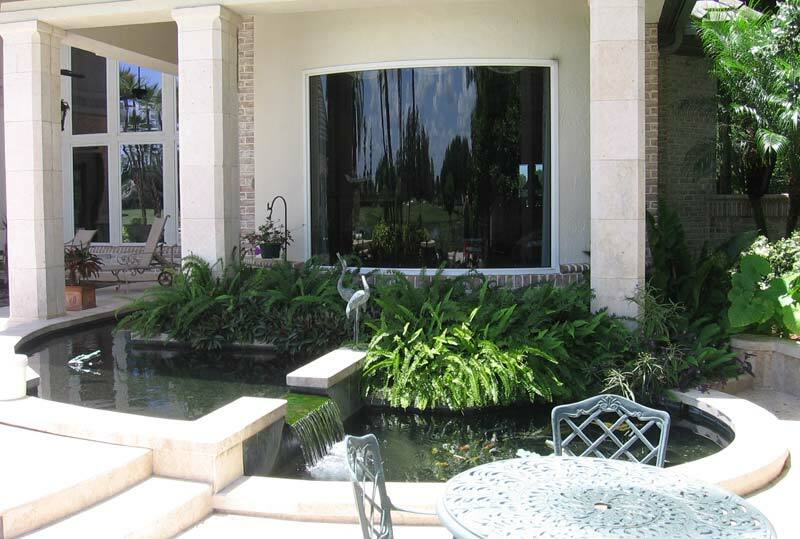 The landscape is low maintenance and salt water-friendly.